President Donald Trump is not happy about Spike Lee's BlacKkKlansman Academy Award acceptance speech. Former President Barack Obama's favorite movies of 2018 include big hits like Black Panther and indies such as Blindspotting. Will The Meg Devour the Box Office as Summer Comes to a Close? Jason Statham's The Meg opens against Slender Man and BlacKkKlansman this weekend. Spike Lee delivers a distinct cinema experience with BlacKkKlansman that is provocative and thoughtful. Focus Features has released the first trailer for director Spike Lee's latest movie BlacKkKlansman, starring Adam Driver and John David Washington. Focus Features has released the first photo and synopsis for Spike Lee's BlacKkKlansman featuring Adam Driver and John David Washington. 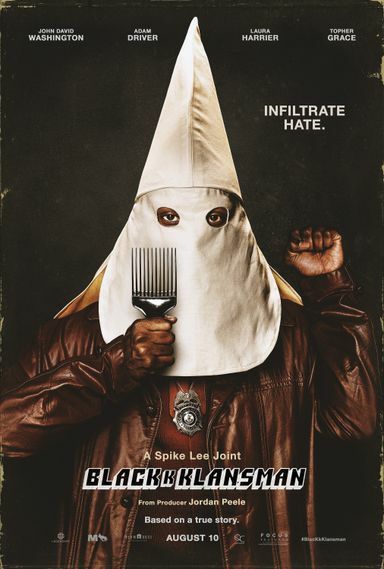 Spike Lee tells the provocative story of a Colorado Springs police officer who went undercover to infiltrate the Ku Klux Klan in BlacKkKlansman. Adam Driver has become the latest cast member to board director Spike Lee's Black Klansman, alongside John David Washington and Laura Harrier. Spike Lee will direct Black Klansman, while producing with Jordan Peele, based on the true story of a black police officer that infiltrated the KKK. Klansman tells the story of Ron Stallworth, a detective in Colorado Springs, Colorado, who in 1978 answered an ad in the local newspaper seeking new Klan members. He not only gained membership, but rose through the ranks to become the head of the local chapter. Stallworth, who is black, was able to gather all sorts of intelligence by pretending to be a white supremacist on the phone or via other forms of correspondence but sent a white fellow officer in his place for any in-person meetings. During his undercover work, Stallworth managed to sabotage several cross-burnings and other activities of the notorious hate group.